The report recommended major changes in the teaching process in India that had led children to memorise what they were taught without really comprehending it. In 1993, a committee chaired by the late Professor Yash Pal submitted its report to the Ministry of Human Resource Development. The committee was set up two years earlier in response to an emotional speech the novelist RK Narayan had given in the Rajya Sabha, where he was a nominated member. This was his maiden speech and the topic he chose to discuss was the burden of the school bag that he had seen children carry every morning. He said that school bags and the daily drudgery of our children’s lives represented a national madness. When Narayan ended his speech, many members had tears in their eyes. The committee chaired by Yash Pal was asked to find out why school bags were getting so heavy and what could be done to solve the problem. A circular issued by the Ministry of Human Resource Development last week has brought the school bag back in focus. The circular lays down rules regarding the maximum weight of the bag that school children can be asked to carry. It is 1.5 kg for Class 1 and Class 2, and 2.3 kg for Classes 3, 4 and 5. It jumps to 4 kg for Classes 6, 7 and 8, and finally to 5 kg for Class 10. Homework is banned for Classes 1 and 2. How these rules will be implemented and who exactly will be held responsible if the rules are breached are interesting questions to consider. Imagine an inspector catching a Class 3 student’s bag weighing more than 2.3 kg. The headmistress will perhaps empty the child’s water bottle or throw the lunchbox out to bring the bag within the prescribed limit. This year is the 25th anniversary of the Yash Pal committee’s report, Learning without Burden. Its analysis shows that heavy schoolbags are only a symptom of deeper problems that lie in the concept of knowledge shared by curriculum designers, teachers and parents. Knowledge is commonly viewed as a body of information to be memorised for regurgitation during examination. The Yash Pal report berated the common one-way teaching process that stifles children’s own desire to learn. In this process, haranguing begins in the nursery and mutates into a regime of oppression through daily homework and weekly tests. The final kill comes with the Board and entrance exams. Cramming is what helps most children to cope with life. And some who cannot, end their lives. The Yash Pal report gave a dozen concise recommendations. Some of these were aimed at policy reforms while others were to be implemented at the school level. In the former category were ideas for improved curricular designing, teacher training and the examination system. Yash Pal chaired the drafting committee of the National Curriculum Framework (2005), which elaborated on the older recommendations, aiming to promote understanding rather than memorisation in schools, and encouraging children to “construct” knowledge on their own. The National Council of Educational Research and Training, the top advisory body on matters of curriculum design and textbooks, implemented these recommendations in its new syllabi and textbooks. The recommendations for changes in teacher training and exam reforms did not get the same attention from parallel organisations. Ideas for change at the school level aroused initial enthusiasm but the larger social pressure to maintain the status quo, especially in the context of homework, regular testing and coaching discouraged any significant shifts in institutional routines. Last week’s instructions issued by the human resource development ministry ignore the broader perspective of the Yash Pal report and the National Curriculum Framework. The list of the permissible weight of school bags given in the circular reminds me of a story about the late JP Naik who was member-secretary of the Kothari Commission (1964-’66). After the approval of its report, Naik said, the Maharashtra government issued a circular, instructing all schools to strictly adhere to child-centred methods. The beauty of such circulars lies in their directness. The human resource development ministry’s circular assumes that someone will weigh the bag and fix responsibility if the weight exceeds the specified limit. On the number of subjects and textbooks, the circular follows the National Council of Educational Research and Training’s practice, paying little attention to the diversity of practices followed in different states and by private schools across the country. As for pedagogy and examination playing a crucial role in making the schoolbag heavy, the circular has little to offer. In his book, The Epic City, Kushanawa Choudhury offers a description of Kolkata’s College Street. 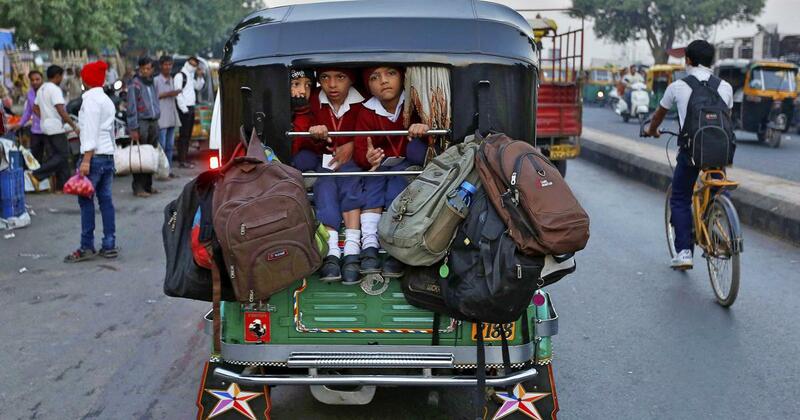 We get a glimpse of the throttling grip in which exam guides and other such books hold the vast majority of children. “Publishers have realized that what little money is to be made comes from cashing in on the insecurities of the young,” wrote Choudhury. The Yash Pal report brought the human resources development ministry and the rest of us close to this truth about our education system. A quarter century later, the ministry prefers to weigh the schoolbag rather than look inside it. Krishna Kumar is a former director of NCERT and the author of Education, Conflict and Peace.